Only English will make us competitive! MANILA - Imperial Manila, your K+12 is suspect, to say the least, as would be a Filipedia. Secretary Armin Luistro, ladies and gentlemen of the Imperial Department of Education (DepEd), children, your standards are absolutely rural, belonging to the back country, certainly not primitive but definitely tribal. 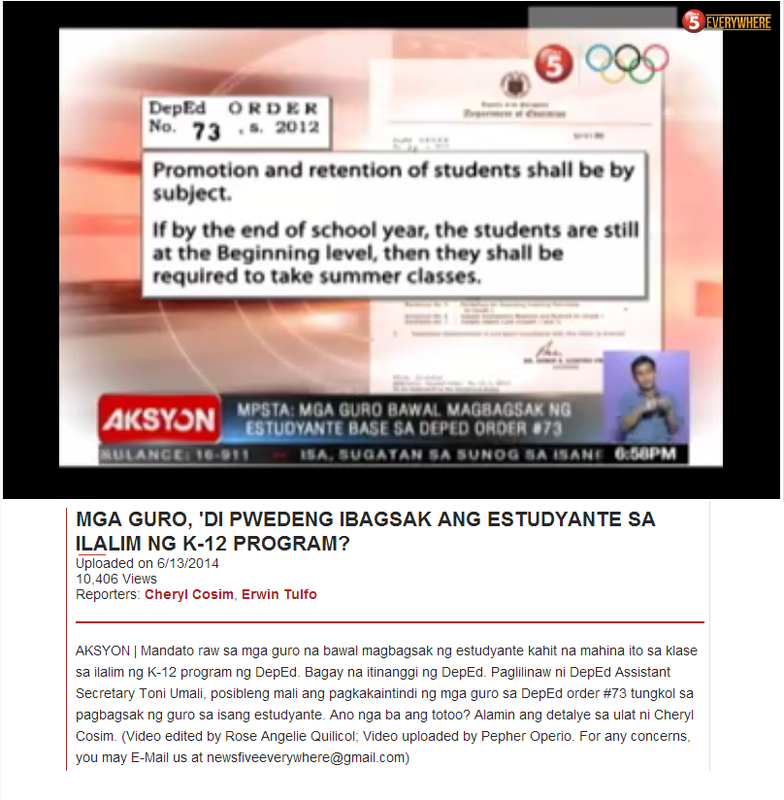 People, I'm not against the DepEd counting from 1 to 12 grades, if that's all you know how to count. But with your K+12 curriculum, you are unquestionably behind the times, despite your claim of keeping up with the times. Let me give you a dose of your own educational medicine. (6) Music, Arts, Physical Education, and Health (MAPEH). People, there are many questionable aspects of this educational package, including MAPEH, but I will confine myself this time to the core academic areas. Notice: (2) Filipino (Language), (4) Araling Panlipunan (Social Studies), and (5) Edukasyon sa Pagpapakatao (Humanities, I presume). 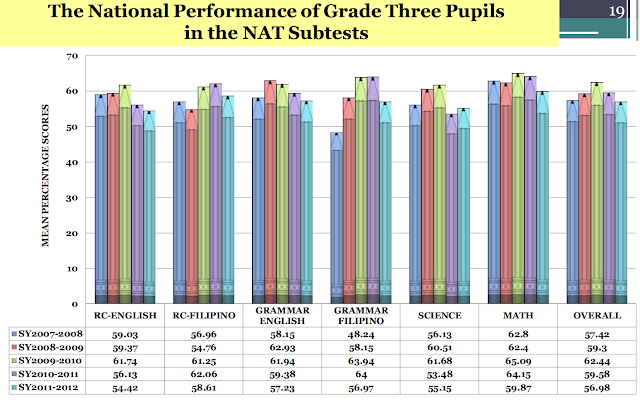 3 out of 6; that means that 50% of the core areas are to be taught in Filipino (Tagalog). So, I must be out of my mind if I believe you people of DepEd when you claim that your K+12 program will "improve the (global) competitiveness of our country's graduates" - when did Filipino (Tagalog) ever become globally competitive?! That is a thought as ridiculous as a Filipedia. Children, if you want to learn about teaching global competitiveness within K+12, let me take you to India, where we find the International School of Hyderabad (ISH). Yes, as a teacher I know that teachers have to learn too. ISH is a 40-year old school, set up in 1972 by parents, now 30 years institutionally under and located on the campus of the International Crops Research Institute for the Semi-Arid Tropics (ICRISAT) in Hyderabad. Yes, ISH has a K+12 program you should be jealous about. The ISH's mission is to develop responsible global citizens through (the school's) proactive and adaptable professionals, evolving and progressive curriculum, and world-class facilities. Today, ISH enrols over 250 students from 26 countries and is the best school in its class in the city without a doubt. Professors, instructors and teachers all must learn from the best! (1) Well-cultivated self-awareness - The first secret of success lies inside each one of us. We need to cultivate a sense of our personal strengths and be aware of our weaknesses. (2) Compelling vision - The second secret is being visionary, to have a dream, to be driven to be better each time. (3) Masterful execution - Leaders drive results. They possess good planning, organizing and delivery skills. (4) Real way with people - A leader must have the ability to get others to act in the desired way. They win respect from those who must be influenced, and build mutual respect. (5) Relevance and social contribution -Successful leaders are true change agents… They are memorable because they change people's lives for the better. (6) Renewal and continuous learning and adaptation - Lastly, successful leaders have an uncanny ability to reinvent themselves in the face of incessant change. They have to deal with increasingly complex challenges, the need to innovate to be competitive, to understand and master technological advances and operate in a global environment. Remember, William Dar is talking to high school graduates. How do you teach all that in Filipino (Tagalog)?! (1) Your school must nurture a dynamic environment in which every child is valued and at the same time challenged. In the Philippines, only those in the Top 10 are valued and challenged; those who fail are passed anyway. (2) Your school must offer individualized and personalized approach to learning. In the Philippines, if you have 50 students to a class, how do you do that? Be creative! You don't need a classroom. There is information technology waiting to be tapped. All you have to do is use your head. (3) Place your high priority on learning how to learn, learning by doing, and thinking critically.In the Philippines, the high priority is placed on memorizing lessons, and criticizing the government's action or inaction. "The ISH's vision is to provide high-quality holistic education in an inspiring learning environment that maximizes the potential of each individual to become a responsible global citizen" (ishyd.org). People of DepEd, your vision is local, not global. ISH has its own curriculum "originally developed from the English National Curriculum." People of DepEd, if you want Filipino schoolchildren to become globally competitive, by all means, teach them English at all times! How did ISH become the best? First, it borrowed from the best. So, in Grades 9-10, ISH follows the IGCSE, an international curriculum developed and administered by Cambridge University. In Grades 11-12, ISH follows the International Baccalaureate program, the most widely recognized international curriculum in the world. And ISH is accredited by 2 foreign accreditation agencies: the New England Association of Schools and Colleges, and the Council of International Schools. Dar said, "Let me underscore that the future belongs to the young who comprise more than half the world´s population. They are speaking out and taking active leadership roles throughout society to build a world truly fit for a younger generation." People, if we teach them right, the youth are the hope of the fatherland of the future. "As graduates of ISH," Dar said, "you have more than what it takes to lead and succeed. Go and capture your moment in the sun." Filipino high school students could go and do likewise - but only if we teach them well, and in English. People, only the best is good enough! YouScooper Maria Trinidad Toriano shares this photo of students attending a class amid flood water at a public high school in Hagonoy, Bulacan. Toriano, a teacher of the school, reports that the area is a catch basin every time there is a high tide. She adds the high tide happens every other week and that floods rise up to knee-level. The tide only appears on certain times of the day. It starts at around 11AM and disappears at around 2PM. Hello there, You have done a great job. I'll definitely digg it and personally recommend to my friends. I am sure they'll be benefited from this site.